A metal detector is the ideal tool for hunting gold deposits that are of sufficient size to be detected. This is especially true when you search exposed bedrock as these are some of the best places to find detectable gold nuggets close to the surface. Exposed bedrock is the ideal place to search for gold with your metal detector as it can only penetrate short distance into the ground. 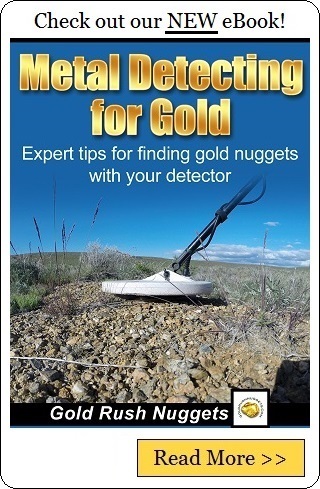 Many rich areas have significant overburden that do not allow the gold beneath them to be detected, but gold deposits on exposed bedrock are either right at or just below the surface so your metal detector will be quite useful when searching in these areas. Bedrock is part of the top layer of the crust of the Earth and there are countless different varieties that make up its composition. In gold country, granite, slate, serpentine and schist are just some types that are commonly found. However, even more important than the composition is the actual texture of the surface of bedrock. Some bedrock types are very smooth and do not catch and trap gold very well. A rougher textured bedrock is more likely to hold gold nuggets within the cracks. 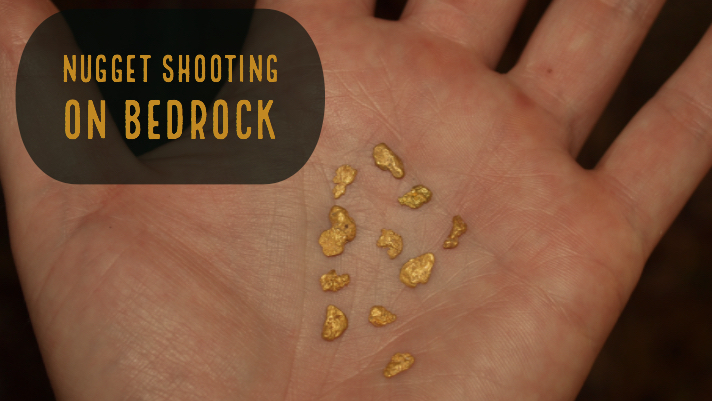 For using your metal detector to find gold, rough bedrock is your best bet. This is because rough bedrock with plenty of cracks makes a natural location for gold to be captured and retained for you to find with your detector. During ancient times when a stream or river passed over the area, the gold that travelled downstream would often get caught in the cracks and niches of bedrock and remain stuck in place and even building up over with more gold getting caught. The same happens with natural erosion and gravitational movement of gold downhill. It will continue to move downhill until something captures and holds it. Rough textured bedrock does this perfectly. The gold remains in place until the bedrock either breaks down or someone comes along to remove it. Although on rare occasions gold will be discovered on smooth bedrock, generally speaking the surface will be clean as the gold itself would have slid over it and moved on. So, concentrate your efforts on the rough sections that are exposed and easily detectable. Using your metal detector in the rough patches of bedrock will help you find the gold that much more quickly, especially if there is a small layer of dirt or debris that is currently covering the bedrock formation. Your metal detector should be sensitive enough to detect very small nuggets, as this is primarily what you will find. Simply pass your metal detector in a slow, sweep pattern just above the surface and be sure to cover the area carefully as it is easy to miss the sound of small pieces of gold. The placer gold will usually be lodged in the cracks, so be sure to carry a few tools with you to pry out the gold once your metal detector has located it. While some gold may be staring up at you all exposed on the surface, in all likelihood you will have to do a little digging and prying in order to extract the gold from its location. Most of the time you will only find very small pieces but occasionally you might hit larger nuggets that have gone undetected for many years all because others before you didn’t quite pass over that spot. Bedrock is a great place to search for gold nuggets with a metal detector , but it has often been searched before by previous prospectors in the area. So be sure to go slowly and work the bedrock carefully to try and locate nuggets that others have missed.